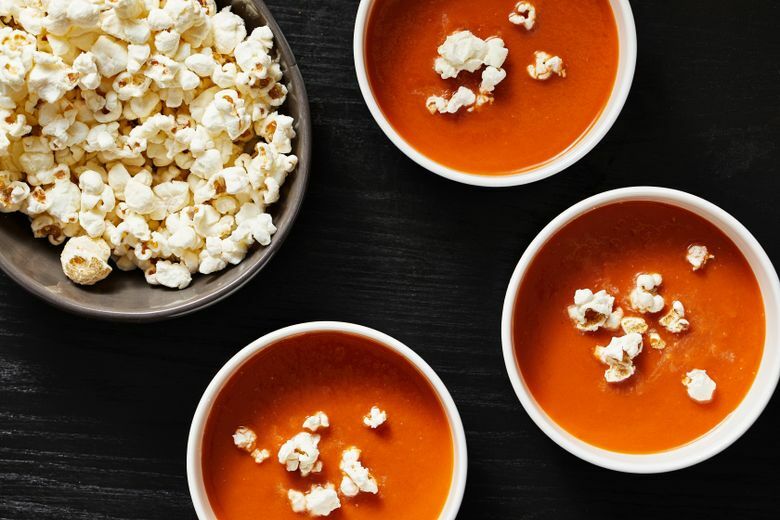 Creamy Tomato Soup With Popcorn. (Photo by Tom McCorkle for The Washington Post). This homemade tomato soup is easy to cook and more nutritious than anything you'll get from popping a can open. And it doesn't take long to make it, either. When I am craving the cozy fulfillment of a bowl of creamy tomato soup, like many people I reach into my kitchen cabinet for a can – but not the one you are probably thinking of. I grab a few cans of no-salt-added, diced tomatoes. While I’m at it, I pull a few other staples from my pantry and refrigerator: Broth, tomato paste, garlic, onion, milk, honey, olive oil, salt and pepper. With these basics, it’s easy to whip up a big batch of tomato soup that is fresher-tasting, more nuanced in flavor, less aggressively sweet and lower in sodium than the typical canned version. It is well worth the small amount of extra effort it takes to make it. Start by sweating the onions and garlic in a little oil, then add the tomatoes, tomato paste and broth. Simmer until the flavors meld, just 15 minutes. Add the milk, a little honey, salt and pepper and then puree everything until it’s nice and smooth. An immersion blender makes this step especially easy, or you can use a regular blender. I prefer using whole milk, which mellows the acidity of the tomatoes and makes everything more luscious, but you could use low-fat milk, almond milk or oat milk. It’s a soup that’s in regular rotation in my house throughout the winter because I always have the ingredients on hand, it comes together fast and in one pot, and it never fails to hit the spot. The last time I made a batch, I had a garnish revelation that gave the soup another dimension entirely, thanks to an opened bag of cheddar popcorn stashed near the canned tomatoes in my pantry. Tossing a handful of the popcorn into the soup right before eating it added a measure of smile-inducing fun that, as it turns out, is as welcomed this time of year as the warm comfort of the soup itself. 1. Heat the oil in a large soup pot over medium heat. Once the oil shimmers, add the onion and cook for about 4 minutes, stirring occasionally, until softened and translucent. 2. Stir in the garlic; cook for about a minute, until fragrant. Add the tomatoes and their juices, the tomato paste and broth; increase the heat to medium-high and bring to a boil, then reduce the heat to medium-low and cook for 15 minutes, stirring occasionally. 3. Stir in the milk, honey, salt and pepper, then remove from the heat. Use an immersion (stick) blender to puree until smooth, or allow the soup mixture to cool slightly before pureeing in batches in a blender. 4. Garnish each portion with the popcorn just before serving.